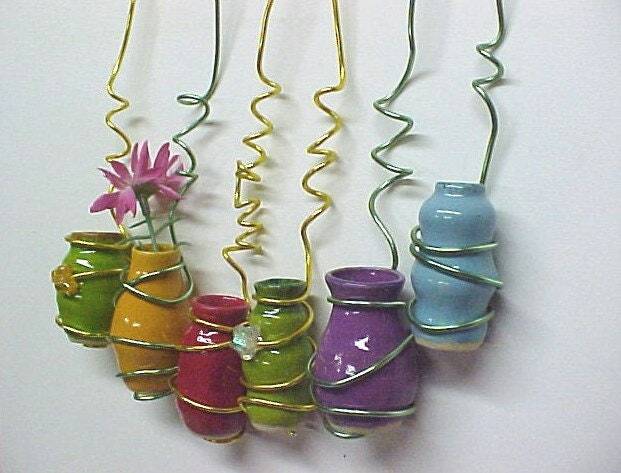 Colorful Mini Hanging Pot Ornament I Choose Just for YOU! This listing is for my "SURPRISE" hanging vase picked just for you by me! If you're a little adventurous, I'd like to choose a unique handmade pottery vase for you! It will be a surprise color & shape that I hope will tickle your fancy! I turned the mini pot on the wheel & glazed in bold color. Shown in the photos are potential vases you might receive. This handcrafted pottery vase hangs by twirled colored metal wire, possibly with decorative bead accents. Ready to mail when you purchase! Will make a lovely Easter gift for a friend or Mother's Day Gift for MOM!